The RSEvents!Pro - RSMediaGallery! 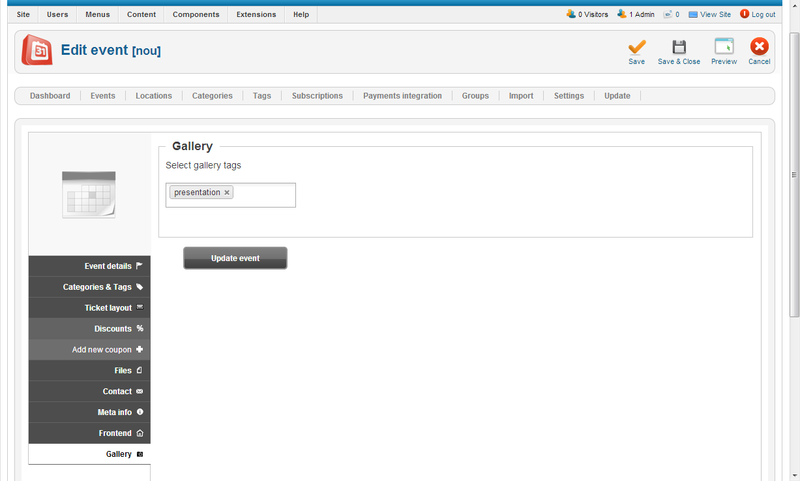 integration allows you to add galleries within the event details page. If you have the latest versions of RSEvents!Pro and RSMediaGallery! installed on the same Joomla! installation, a new tab called "Gallery" will be available (Components > RSEvents!Pro > Settings > Gallery) for configuration as explained below. Thumbnail Size: numeric values (width or height) that allow you to specify the resolution of the generated thumb images. Full Size: numeric values (width or height) that allow you to specify the resolution of the image detail. Use Original Image: use the original image instead of the full resolution crop. 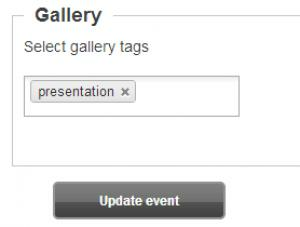 Order Images By: ordering criteria for images that will be displayed within the event gallery area. Number of Items: the number of images that will be displayed. Use 0 for all. Show Title: If enabled the title of the image will be displayed. Show Description: Toggle between showing the description of the image or not. The above settings will be applied for all RSEvents!Pro galleries.